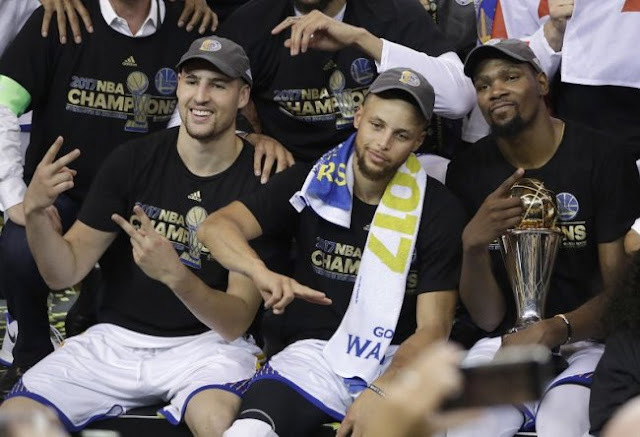 SAN FRANCISCO (KRON) — The Golden State Warriors are touring the African American Museum Tuesday instead of visiting the White House. The traditional champions' invitation was never granted from President Donald Trump — and it appeared the Warriors might have declined it, anyway. So they plan to spend their day in the city with local children Tuesday. The Warriors and students from Kevin Durant's hometown of Seat Pleasant, Maryland, will tour an African American museum in the nation's capital, according to ESPN's Chris Haynes. "We're doing a great thing anyways," All-Star Klay Thompson said Monday, after the Warriors beat the New York Knicks in the opener of a road trip. "The White House is a great honor but there's extenuating circumstances that we felt that we're not comfortable doing. We're not going to politicize anything, we're just going to hang out with some kids, take them to an African-American museum and hopefully teach them things we learned along the way and life lessons, and we'll still be getting some great memories." Warriors All-Star Stephen Curry had said he did not want to go to the White House last September and Trump then made it clear he wasn't welcome, sending a tweet that read : "Going to the White House is considered a great honor for a championship team. Stephen Curry is hesitating, therefore invitation is withdrawn!" The White House visit is traditionally scheduled during the NBA champions' trip to face the Washington Wizards the following season. The Warriors play the Wizards on Wednesday. They met with President Barack Obama after their first championship but don't seem disappointed about not going back this time. "It's kind of beating a dead horse at this point," Curry said. "We're excited to have an opportunity that we're going to tomorrow as a team, but other than that it's a business trip and we're excited to keep the road trip going. So that's really all it's about." NBA Finals MVP Kevin Durant is from the Washington area, and he still played with Oklahoma City when the Warriors won their first title. He said he just wants the children Tuesday to enjoy their chance to meet players such as Curry and Thompson. "Kids from my area don't really get that opportunity to be in front of champions like that," Durant said. "So hopefully it inspires them to just be whatever they want to be in life."